Deep inside a clandestine stronghold sat the Dark Horse Felwinter and Citan, Warlord of the 32nd Sector of Old Russia. A polished obsidian table rested heavily between them. “Didn’t think you’d have the courage to come back here,” said the Warlord. “Situational awareness. Not courage. I go where I can do the most good. Thank you for seeing me.” Felwinter’s voice sounded as hollow as his helmet. Citan wanted to knock it clean off the Iron Lord’s bony shoulders. He could do it with a single punch. Citan’s laugh shook the room. “How is losing territory ever a good thing for a Warlord?” Felwinter folded his hands atop the table. Underneath it, Citan made two fists, a crescent of Light flickering between them. “I invite you to my home after you abandon us, and you come to threaten me?” The Warlord stood, towering over Felwinter. “To broker peace.” Citan thought that even the voice behind the helmet didn’t believe what it said. The floor shuddered as the Warlord upended the massive table with one hand. It smashed into the opposite wall, as tendrils of Void Light passed through it and coalesced into Felwinter’s leaping form. But Felwinter’s momentum continued into a knee-lift that smashed into Citan’s head as the larger man reared back to strike. The Warlord fell, the front of his helm shattering. Felwinter landed next to Citan’s prone body. “Lady Jolder taught me that. 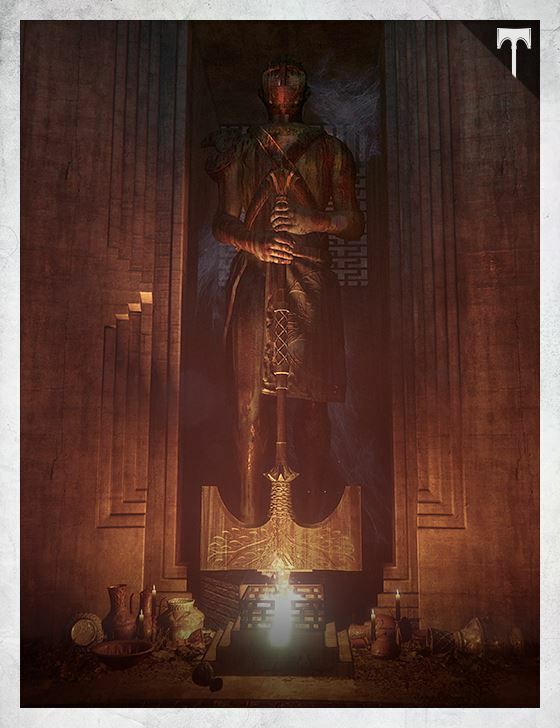 I can’t say the Iron Lords haven’t done me any favors,” the voice intoned. “You know we’ll burn the world down before we let the Iron Lords rule it,” the larger man gasped, breathing out of his mouth, his face a bloody mess. The Void Light in Felwinter’s hand snapped—and so did the Warlord’s neck. He paused, as if waiting for something. Citan’s Ghost sparked into view from above, bringing its eye to bear on its fallen charge. The Warlord emerged from a radiant column, a frenzied shout at his lips. Felwinter’s shotgun cracked like thunder—once for the Warlord, and again for his Ghost.